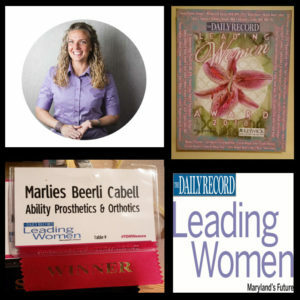 Recently, Ability’s own Marlies Cabell, CPO learned she had been named one of Leading Women’s 40 under 40, by the Daily Record, Baltimore, MD. This achievement identifies and honors women who are 40 years old or younger for their accomplishments thus far in their careers. The recipients are chosen based on professional experience, community involvement, and their inspiration to those around them. Marlies was nominated by her husband Eric after she mentioned to him there was a Leadership Award that exemplifies career achievement. Marlies is modest, but she did feel she had accomplished some exciting things such as her recent certification in the Wood Cheneau Rigo (WCR) bracing technology for scoliosis; she is the 8th orthotist certified in the country. She also is the co-inventor of the Cabell-O weighted ankle foot orthosis (AFO) that Ability and Johns Hopkins Office of Technology Transfer are supporting for US patent application. Eric agreed that Marlies certainly qualified for the honor. At work, she is building centers of excellence for conservative scoliosis treatment in every Ability Office and transferring her skills to her fellow Orthotists who are in training to join Marlies as WCR certified practitioners. When at home, she and her husband (in addition to parenting three of their own children) work as a team to foster to adopt. Fostering in itself is a commitment to inspire change, and this year Governor Hogan recognized Marlies and her husband as Foster Family of the year! Achieving success in business and in her personal life, Marlies has trouble identifying just one thing for which she is most proud. She says, “there is no one thing that stands out to me because I am a CPO from 8am-6:30pm, and a mom of 8 from 6:30-8am the next morning. Both responsibilities exemplify being named as one of Leading Women’s 40 under 40. What’s next for Marlies? Thinking “outside the box” and building the Cabell-O weighted AFO that is awaiting patent approval. She has her sights on working with acute stroke patients to see about improving proprioceptive feedback for daily walking and improvement. In the New Year, she also plans to support the Wood Cheneau Rigo Center of Excellence for Conservative Scoliosis treatment and get more Ability P&O clinicians through tot certification so that every Ability office is open to each diagnosed patient that wants to use the most effective custom scoliosis thoracic lumbar sacral orthosis (TLSO) available on the market. At Ability, we are proud and honored to have Marlies on our team. This award recognizes what we’ve known all along; she is inspiring change and chasing her dreams. Congratulations, Marlies!